Xilitu Zhao (xí lì tú zhào 席力图召), also called Xiaozhao Temple (xiǎo zhào sì 小召寺), is situated in Stone Lane (shí tóu xiàng 石头巷), Yuquan District (yù quán qū 玉泉区), Hohhot City. It is about 100 meters (328 feet) away from the famous Dazhao Temple (dà zhào sì 大召寺). Xilituzhao is a key cultural protection unit of Inner Mongolia Autonomous Region. Xilitu, means "Holy Seat" in Mongolian, and Zhao means the temple. The temple is similar to the Dazhao Temple in terms of architecture and shape, originally built in the Ming Dynasty (míng cháo 明朝) (1468-1644 AD) as well. 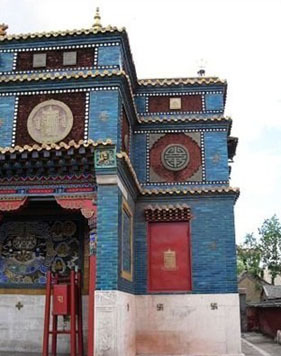 It was, however, razed to the ground by fire and then rebuilt in the 19th century, then partially destroyed in the Cultural Revolution (1966-1976 AD) before being restored again. The new restoration is a work of art, with much of the temple structures left with attractive bare wood or painted in quiet reds and greens, that differentiates it from the other temple and many temples of its type around China. Xilitu Zhao remains active, and has, since 1735, always acted as the official residence of the Living Buddha, who reins over Buddhist religious affairs in the city. On entering nowadays you may come across Tibetan monks and followers in prayer, you may get the chance to see one of the temple festivals, where traditional instruments are played, or you may get the chance to head underneath the temple, where caverns contain graphic depictions of the tortures that will be metered out for those who are sinners in this life, a sort of Tibetan Buddhist version of hell. It is sometimes possible to find a monk who can speak English and can take you around. The temple was quite grand and unique in architectural style. It remains intact despite being weathered by wind and rain for 400 years. Xilitu Zhao was built in a traditional layout of the Han's architectural style. Covering an area of 5,000 square meters (5,979 square yards), the whole architectural complex stands in a symmetrical order. 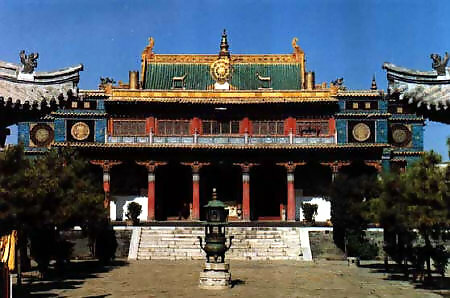 The main hall consisting of a sutra hall and a Buddha worshiping hall is the main structure of the palace. 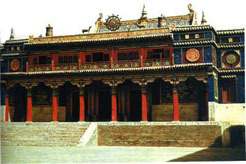 It is a Tibetan style wooden structure, with walls decorated with colored glazed brick. The roof is covered with green glazed tiles. The Buddha worshiping hall was damaged in a fire though the sutra hall preserves its original condition. To the east of the hall stands a white stupa made of white marble at a height of 15 meters (49 feet). 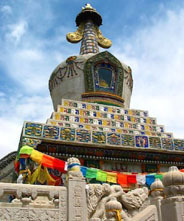 It is the best preserved Lama pagoda of bowl-earthen style in Inner Mongolia Autonomous Region. Every year, some religious activities are held in Xilitu Zhao, such as the ritual dance performances and the Buddhist conference. Opening Hours: 8:30 a.m. – 6:00 p.m. Address: The temple is slightly to the north of Dazhao Temple, also on Danan Street (dà nán jiē 大南街). How to Get there: From the intersection of Tongdao Street (tōng dào jiē 通道街) and Zhongshan Road (zhōng shān lù 中山路) (at the Great Mosque), head southwards along Danan Street and the temple will be on your left.